When I was a kid, my parents bought a tract of land near the West Virginia border. Nestled in the Appalachian mountains, in the middle of a huge forest, it was incredibly isolated and incredibly beautiful. Over the next several years, my family worked on building our ideal vacation home. We started with a big basement and a log cabin kit. by the time we sold it, several years later, we had a partially-finished log cabin standing over a completely unfinished basement. The biggest problem was money. Even the do-it-yourself (with-the-help-of-several-contractors) kit that we bought was fairly expensive, and the construction, bricklaying, staining, chinking, roof-building, and assorted other tasks tacked on a huge amount of money. Beyond that, there was the difficulty of transporting materials to the site, troubles with building a septic field, and assorted other miseries. Over time, the construction became a constant drain on our family finances and we never really finished the cabin. With that in mind, I was really interested in the International Dome House Company. Constructed from pre-molded industrial-strength Styrofoam pieces, the buildings are designed to be constructed by three people of reasonable strength. They are flame-retardant, typhoon-resistant, and completely unappetizing for termites. 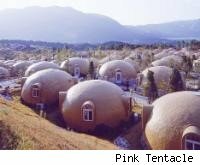 On the other hand, they look like igloos or mold cultures. Still, given some imagination, a little bit of time, and a decent paint palette, there really doesn't seem to be any limit to the creative possibilities. Bruce Watson is a freelance writer, blogger, and all-around cheapskate. He'd make his sundae home into a banana split if the Dome house people could figure out how to make a gargantuan Styrofoam banana.